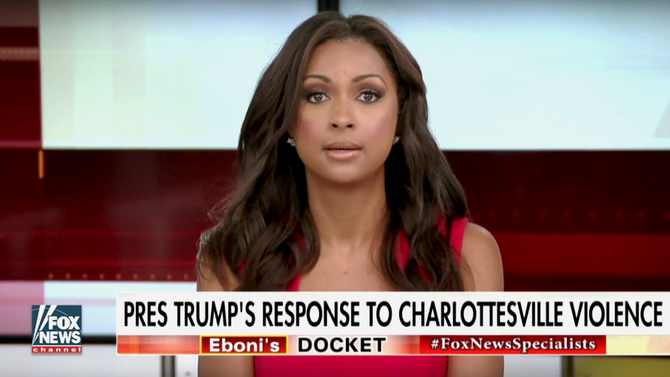 *Fox News host Eboni K. Williams says she’s been feeling the wrath of viewers after she did what few others on her network has dared to do: call out Donald Trump. During her “Eboni’s Docket” segment, which she writes herself, she criticized Trump for failing to call out white nationalist groups by name in his condemnation of the violence that occurred at Charlottesville, Va. last weekend. She told Variety that her personal website, which usually receives an average of 10-15 emails after each segment, was flooded with over 150 emails, only three of which were anything other than “seething, scathing” takedowns. Her book publisher became so concerned that it asked her to request additional security from Fox News, which she did — Williams is now escorted to and from the building when she arrives to work. Her book, “Pretty Powerful: Appearance, Substance, and Success,” is available next month. Williams said she typically gets responses from people disagreeing with her views, but praising her ability to formulate her arguments and present them on-air, which is what makes this week’s vitriolic reaction so shocking for her. She feels it’s partly due to President Trump’s “tacit compliance” of violent political rhetoric.